Montrose Scotland can offer some of the best shooting for geese in the world, and with the number of geese increasing each year it can only get better. Goose shooting in the Montrose basin area is now the best place in the UK to shoot inland geese. The geese are flying further southwards every year, so why travel further north than you have to? You will save time, money and fuel, and get MORE TIME FOR SHOOTING! 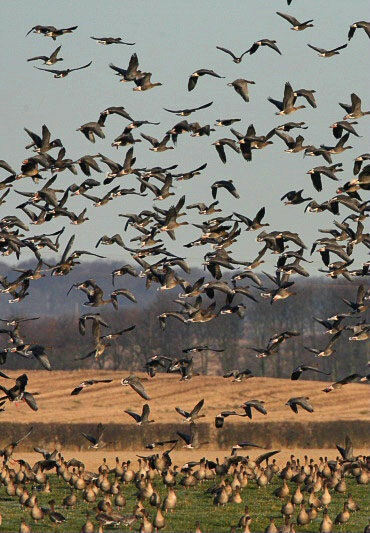 In the Montrose Basin, the number of geese migrating into this area is increasing every year, with 65,000 + last year. All shooting with Montrose shooting breaks will be carried out on local farmland in the Montrose Basin area. We are set up and ready by first light, ready for the first flight of geese to arrive from the Basin to the fields. All you will need to do is wake up very early we will do the rest. We will take you out to the field and set up the decoys pattern, then get the hide ready for the first birds to arrive, we can leave a guide with you for the duration of your shoot if you require. When the geese start to arrive at the field you are set up in you will get about 3hrs of shooting at them, thick and fast. There are no time limits on shooting over the field you are in but please remember once the geese have gone through you will be just sitting there thinking about what you have just shot. You will only be shooting on fields that have had geese feeding in them the day before, if possible we will take you out to view the field that you will be shooting over the next morning. We will always keep you in informed and explain to you what is going to happen on the next shooting/flight we are shooting on. Montrose Shooting Breaks will do everything in their power to give you a good flight on the geese but please remember we cannot shoot the birds for you that is up to you!